Enjoy better sleep & portable audio — a sound machine with a twist! 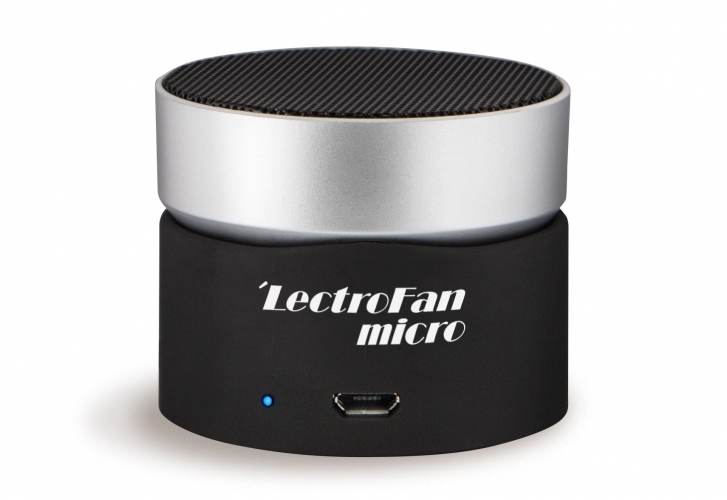 Buy your Lectrofan Micro Wireless now in our online shop! White noise, by the technical definition, is a consistent noise that comes out evenly across all hearable frequencies. White noise is just an equal amount at every frequency, from low to high, that a human being can hear. When a noise wakes you up in the night, it’s not the noise itself that wakes you up, per se, but the sudden change or inconsistencies in noise that jar you. White noise creates a masking effect, blocking out those sudden changes that frustrate light sleepers, or people trying to fall asleep. “The simple version is that hearing still works while you’re asleep,” says Seth S. Horowitz, a neuroscientist and author of The Universal Sense: How Hearing Shapes the Mind. *Lecher, Colin. “FYI: Why Does White Noise Help People Sleep?” Popular Science. Popular Science, 14 Feb. 2014. Web. 07 Apr. 2015. LectroFan’s non-repeating (temporal variable) white noise and fan sounds are dynamically generated using an algorithm that creates a truly random sound. Other white noise machines use looping sound clips that wakes up your brain, while others use actual fans that can’t get loud enough to block out anything. LectroFan has adjustable volume control to mask all levels of noise and a timer for those mid-day naps. In a recent study, researches concluded that cognitive performance can be moderated by external stimulation in a non-clinical group of teacher-rated inattentive participants. If replicated this finding could have practical applications offering a non-invasive help to improve school results in children with attentional problems. In particular awareness should be raised regarding the possibility that the environment has be individually adjusted to the need of the children, where inattentive children in a normal population show noise benefit when performing cognitive tasks. In our data these effects eliminated the differences between high performing, attentive and low performing inattentive children. The possibility that attention can be improved by the addition of carefully controlled levels of white noise into ones environment is potentially of major practical significance. Currently ADHD children are treated successful with medication, where environmental stimulation could be seen as a complementary method to deal with inattentive problems. This could be of particular importance for the significant population of parents that are uneasy about the use of medication. *Söderlund, Göran, Sverker Sikström, Jan Loftesnes, and Edmund Sonuga-Barke. “The Effects of Background White Noise on Memory Performance in Inattentive School Children.” Behavioral and Brain Functions. Behavioral and Brain Functions, 29 Sept. 2010. Web. 07 Apr. 2015. What do babies get stressed about? Just about everything. They’re stressed when they’re over-tired, they’re stressed because their world is more stimulating than they’re ready to handle, they’re overwhelmed with lights, faces, and excitement. White noise creates a safe space for them by blocking out that stimulation. This helps them fall asleep more easily and stay asleep longer. Babies have what are called “sleep arousals”, usually about every 20-45 minutes. Ever wonder why your baby only naps for 20 minutes at a time? Of course you have. Well it’s because when they reach sleep arousal around the 20 minute mark and are unable to fall back into deeper sleep. Nap time is over. White noise helps babies achieve these sleep arousals for longer, providing more peaceful naps for both of you. It also helps to block out the noise of life (other siblings, TV’s, vacuum cleaners, the neighbors blaring “Never Gonna Give You Up”, etc.) that can interfere with naps and night sleep. Did you know that shushing is a sound that people universally understand and make with babies? Shushing is just white noise that you make yourself. The key to using white noise to help calm a crying baby is that it needs to be louder than the crying. Also you may need to continue to shush for a while. But loud, sustained shushing right next to your baby is more than a bit impractical. So, if you’re starting to feel dizzy and/or see stars it’s time to outsource your shushing to LectroFan. With variable volume control, you can protect your child’s hearing while still providing them with calming white noise and fan sounds. The built in, incremental timer lets you set their nap time and gently wake up on their own after LectroFan gradually reduces its volume to off. The concept that an external sound could suppress perception of an internal one was first realized clinically in the mid 1970s by Dr Jack Vernon, when he reported that white noise was effective in alleviating tinnitus. Tinnitus maskers are commonly used by tinnitus sufferers when trying to sleep or relax, as it is within these quiet environments that the tinnitus is at its most noticeable. It is widely believed that continued use of tinnitus masking can inhibit a neurological process known as habituation. This is a physical process which involves neuronal remapping in the auditory cortex of the brain leading to desensitization of tinnitus. Generally it is ill advised to fully mask the tinnitus instead the masker or noise generating device should be set just below the level of the tinnitus to promote habituation. The promotion of habituation is the key clinical outcome of tinnitus retraining therapy which uses a combination of sound therapy and counselling. The use of sound in a clinical setting using specialist equipment can be used to completely mask tinnitus in 95% of tinnitus patients. Whether you’re away on business or travelling for the family vacation, LectroFan is able to help create a consistent sleeping environment that is essential for getting a good night’s rest. Hotels, motels, B&Bs, friends apartments, relative’s houses, no matter where you go, it’s not home. External noises that you’re not accustomed to can disturb your night, and when you’re travelling, you can’t afford to lose any sleep. Just crawl in bed, pick your fan sound or white noise, close your eyes and relax. The LectroFan is powered via USB, in addition to a wall outlet or any powered USB source to include laptops, TVs, and even battery packs (sold separately). The machine can operate on dual voltage (100 to 240 VAC), making it perfect for international travel. Its low weight (about one pound), small size, and its sleek and sturdy travel case (sold separately) make it ideal for travel use. Any business or organization handling sensitive, personal, or financial information must take deliberate measures to safeguard the print and electronic records of its clients. Financial, personal, and medical privacy are now considered fundamental rights protected by law or governed by regulation. The same care goes into protecting “trade secrets”, products and processes covered by Non-Disclosure Agreements (NDA) or product information that provides the necessary edge in an increasingly competitive global marketplace. From financial institutions and manufacturers to medical facilities and social service agencies, most industries must protect records and information using all reasonable means available. In today’s environment of collaborative office space, high tech gadgetry, and mass communications, information that can be picked up through intentional or unintentional voice eavesdropping threatens to undermine even the most sophisticated security systems. LectroFan’s sound masking is dynamic because the sounds it is intended to block are dynamic. Structural privacy elements are fixed and cannot adapt to intruding sounds that change in level. LectroFan’s sound masking can adapt from location to location as well as across variable noise levels, to adapt to changing environmental conditions and is by far the least expensive tool for providing privacy. Ever moved into a new house or apartment and the neighbours were just so loud you lost sleep and never got any peace and quiet when you got home? Are your walls so thin that you can hear the guy two houses down blasting “Never Gonna Give You Up”? Ever had to sleep with ear plugs in or listening to your headphones? Can you identify specific dogs in your neighbourhood based on their bark? If you answered yes to any of these questions, you know that the solutions suggested by every blog, website, and know-it-all friend, are all impractical, expensive, and ineffective. You probably don’t have the time turn your apartment into a sound proof recording studio with acoustic insulation. And everyone who has ever confronted a noisy neighbour knows, they know they are noisy and they just don’t care. Finally, as fashionable as walking around your house wearing giant, expensive, noise-cancelling headphones is, it’s just probably not going to happen. So rather than trying to break the bank, reason with a rock, or walk around like it’s winter with earmuffs, get a LectroFan and shut your neighbours up. Since most sound masking is used in offices, a number of cognitive psychology studies have been made that relate specifically to the office environment. In a recent study, it was found that there was a modest stress increase and diminished motivation caused by typical office noises, including speech. They recommended the use of sound masking under the control of the worker. The masking must reduce the difference between the steady background level and the transient levels associated with both speech and other sounds. Motivation and productivity are improved when this is accomplished. The masking sound itself must not change rapidly and should be as meaningless as possible. LectroFan meets all the requirements and puts your office environment back in your hands. From increasing your productivity to blocking out Captain Loudtalker and his yelling phone conversations, the LectroFan will quickly become the best friend you have at the office. Defeat the endless chatter, the constant clicking of the keyboards, and the “Never Gonna Give You Up“ track on repeat. Defend your cube with the heptagon! LectroFan’s modern design seamlessly blends into the office environment, unless you have a very old and outdated office, then it would probably stand out. In a good way.